The County Council’s Land Use Committee has recommended passage of bills approving a zoning change and community plan amendment to facilitate development of the long-awaited Kihei high school on 77 acres fronting Piilani Highway. By resolution on April 5, the council referred the bills to the Maui Planning Commission, a necessary prerequisite to council-initiated land use entitlements under the County Charter. When considered in committee on March 13, Council Member Donald G. Couch Jr., who holds the South Maui residency seat and introduced the resolution, made the motion to recommend its adoption. “This is a much-needed facility for South Maui,” Council Member Couch said at the time. Indeed, high school students in Kihei – which has been one of Maui’s fastest-growing communities for many years – generally must travel to Central Maui just to go to school. The project’s environmental impact statement was accepted by Gov. Neil Abercrombie on Nov. 9, 2012. The state land use district boundary amendment to change the property’s designation from agricultural to urban was filed and accepted for processing on Feb. 20, with the state Land Use Commission’s final decision filed July 29. The Maui Planning Commission received public testimony and recommended approval of the county land use bills at its July 23 meeting. After the Land Use Committee’s recommendation, the bills advance to full council for first and second readings before the mayor signs them into law. The bills would change the zoning on approximately 77 acres and the community plan designation on approximately 29 acres from the Agricultural District to the P-1 Public/Quasi-Public District. The Kihei high school project has involved tremendous coordination among state and county authorities and community leaders. Residents who have fought for this project for many years have closely watched the approval process, helping to keep it on track. Construction of a new school would further the county’s general plan objectives of improving education, supporting neighborhood schools and minimizing traffic congestion. Maui High School, which is burdened with overcrowding, will also benefit from the project. In addition, the subject property is within an area designated for growth in the Maui Island Plan. Notwithstanding the numerous obvious benefits, a project of this magnitude has considerable impacts. Development of the school will require improvements to Piilani Highway, and may require intersection signalization, as well as substantial grading work and the construction of drainage utilities. Council members, the Maui Planning Commission, the Department of Planning, the Department of Education and other state agencies such as the Land Use Commission and Office of Planning deserve credit for considering pedestrian and bicycle access systems, adequate public transit, overflow parking and lighting for special events, crime prevention and other important elements in the project’s design. Many South Maui families will realize savings in transportation costs. In addition, the DOE expects to benefit financially from increased efficiency among Maui’s high schools. As many as 800 students and 120 staff will walk the halls of the Kihei high school after Phase I of the development is completed. After Phase II’s completion, the capacity is expected to expand to 1,650 students and 180 staff. 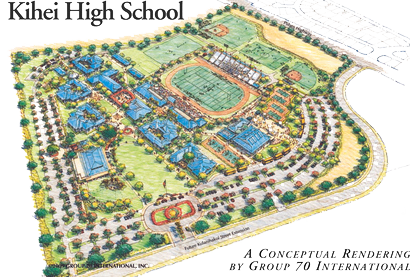 With pending funding, the DOE intends for the Kihei high school to open in 2018. * Robert Carroll holds the County Council seat for the East Maui residency area. He is vice chair of the council and chair of the Land Use Committee. “Chair’s 3 Minutes” is a weekly column to explain the latest news on county legislative matters.